Washington Concert Opera is a professional opera company located in Washington, D.C. in the United States which presents operas in a concert format with full orchestra and chorus. WCO’s distinctive repertoire consists of operas which either have not been presented recently in the Washington area, or are infrequently performed anywhere, or which represent opportunities to showcase artists. Operas and musicals presented in concert version are performances with limited or no staging, sets and costumes. The singers and the orchestra are usually together on the stage or concert platform rather than placing the orchestra in an orchestra pit. Often the chorus is placed towards the rear or sides of the stage, with the principal singers at the front of the stage, in front of the orchestra. As compared with a fully staged theatre production, the lower cost of producing a concert version and the reduced rehearsal time required have made this style of theatre performance increasingly popular in the 21st century, although the practice dates back to some of the earliest operas of the 17th century. Lisner Auditorium is an auditorium located on the campus of The George Washington University, at 730 21st Street, Northwest, Washington, D.C.. It is named for Abram Lisner, a trustee of the University who donated the money for its construction. The George Washington University is a private research university in Washington, D.C. It was chartered in 1821 by an act of the United States Congress. As of the 2005 season, WCO returned to the Lisner Auditorium. Performers are often internationally acclaimed singers, professional musicians and chorus members who give rarely heard, full-length operatic works. Washington Concert Opera has presented almost 50 operas in the concert format since 1986, and they have featured world-class singers who regularly appear on the stages of major opera houses. Wolf Trap National Park for the Performing Arts, is a performing arts center located on 117 acres (47 ha) of national park land in Fairfax County, Virginia, near the town of Vienna. Through a partnership and collaboration of the National Park Service and the non-profit Wolf Trap Foundation for the Performing Arts, the Park offers both natural and cultural resources. William Tell is a folk hero of Switzerland. According to the legend, Tell was an expert marksman with the crossbow who assassinated Albrecht Gessler, a tyrannical reeve of the Austrian dukes of the House of Habsburg positioned in Altdorf, in the canton of Uri. Tell's defiance and tyrannicide encouraged the population to open rebellion and a pact against the foreign rulers with neighbouring Schwyz and Unterwalden, marking the foundation of the Swiss Confederacy. The Wolf Trap Opera Company was founded in 1971 as part of the program of the Wolf Trap Foundation located near the Wolf Trap National Park for the Performing Arts in Fairfax County, Virginia. The company is a residency program for aspiring opera professionals, with its major production being a summer opera festival. In 2002, Antony Walker  became Artistic Director and conductor. He is also Music Director of Pittsburgh Opera and co-artistic director of Pinchgut Opera, a chamber opera company, in Sydney, Australia. Young artists such as Celena Shafer (in Esclarmonde in 2005), and both Sarah Coburn and Lawrence Brownlee—winner of the 2006 Richard Tucker and Marian Anderson Awards—who both appeared in I Puritani in 2007, have also made their area debuts with WCO. 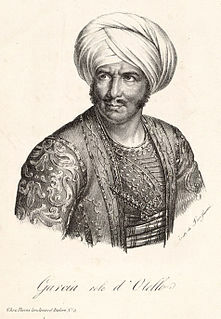 Otello is an opera in three acts by Gioachino Rossini to an Italian libretto by Francesco Maria Berio di Salsa. The work is based on a French adaptation of the story, not Shakespeare's play Othello as neither Rossini nor his librettist knew the English drama. The Washington National Opera (WNO) is an American opera company in Washington, D.C.. Formerly the Opera Society of Washington and the Washington Opera, the company received Congressional designation as the National Opera Company in 2000. Performances are now given in the Opera House of the John F. Kennedy Center for the Performing Arts. Juan Diego Flórez is a Peruvian operatic tenor, particularly known for his roles in bel canto operas. On June 4, 2007, he received his country's highest decoration, the Knight Grand Cross in the Order of the Sun of Peru. Daniele Gatti is an Italian conductor. He is currently artistic advisor of the Mahler Chamber Orchestra and music director of the Teatro dell'Opera di Roma. Vittorio Grigolo is an Italian operatic tenor. Union Avenue Opera is an opera company based in St. Louis, Missouri. The company was founded in 1994 by Scott Schoonover, the music director of Union Avenue Christian Church, which serves as the company's venue in St. Louis' Visitation Park neighborhood. The Opera Orchestra of New York specializes in the performance of opera in concert form. It is particularly known for its work in presenting rarely performed repertory. Among the numerous American premieres it has presented are Puccini’s Edgar, Boito’s Nerone, and Smetana’s Libuše. Grant Gershon is an American conductor and pianist. He is Artistic Director of the Los Angeles Master Chorale, Resident Conductor of the Los Angeles Opera, member of the Board of Councillors for the USC Thornton School of Music and a member of the Chorus America Board of Directors. Joyce DiDonato is an American operatic lyric-coloratura mezzo-soprano notable for her interpretations of the works of Handel, Mozart, and Rossini. Lawrence Brownlee is an American operatic tenor particularly associated with the bel canto repertoire. Describing his voice, Speight Jenkins, general director of the Seattle Opera, said: "There are other singers that sing this repertory very well, but I don't think anyone else has quite as beautiful a sound and as rounded a tone," and praise his "incredible top notes", adding about his high F (F5) in "Credeasi, misera": "With him it's not a scream, it's a beautiful sound." Mezzo-soprano Joyce DiDonato adds: "He is always in service of the music. His natural instrument is just incredibly beautiful. The word 'honey' comes to mind. He also has technical prowess and agility." Alyson Cambridge is an American operatic soprano. In addition to opera, she sings classical song, jazz, and American songbook and popular song. She is also known for her work as a model, actress and host. Michael Fabiano is an American operatic tenor. Born in Montclair, New Jersey, he has performed in leading opera houses throughout the world, including the San Francisco Opera, Metropolitan Opera, Paris Opera, Teatro alla Scala, Canadian Opera Company, Teatro Real, and The Royal Opera among many others. Fabiano is the 2014 Richard Tucker Award winner and the 2014 Beverly Sills Artist Award winner, making him the first singer to win both awards in the same year. The Munich Radio Orchestra is a German symphony orchestra based in Munich. It is one of the two orchestras affiliated with the Bavarian Radio, the other being the Bavarian Radio Symphony Orchestra. The Conservatorio Statale di Musica "Gioachino Rossini" is a music conservatory in Pesaro, Italy. Founded in 1869 with a legacy from the composer Gioachino Rossini, the conservatory officially opened in 1882 with 67 students and was then known as the Liceo musicale Rossini. By 2010 it had an enrollment of approximately 850 students studying for higher diplomas in singing, instrumental performance, composition, musicology, choral conducting, jazz or electronic music. The conservatory also trains music teachers for secondary schools and holds regular master classes. Its seat is the 18th century Palazzo Olivieri–Machirelli on the Piazza Oliveri in Pesaro. Amongst its past Directors are the composers Carlo Pedrotti, Pietro Mascagni, Riccardo Zandonai and Franco Alfano. Mascagni's opera Zanetto had its world premiere at the conservatory in 1896. Julianna Di Giacomo is an American operatic soprano who has had an active international singing career since 1999. She has performed leading roles with several major opera houses, including La Scala in Milan, the Metropolitan Opera in New York City, the Opéra-Comique in Paris, and the Teatro Real in Madrid. On the concert stage she has appeared with several notable orchestras, including the Gothenburg Symphony Orchestra, the Los Angeles Philharmonic, the New York Philharmonic, the Opera Orchestra of New York, and the Vienna Philharmonic. Antony Walker is an Australian conductor. He has been the musical director of Sydney Philharmonia Choirs, chorus master and chief conductor of the Welsh National Opera, artistic director and conductor with the Washington Concert Opera and musical director of the Pittsburgh Opera. He co founded the Pinchgut Opera, the vocal ensemble Cantillation and orchestras Sinfonia Australis and Orchestra of the Antipodes. Michael Spyres is an American operatic tenor. He is particularly associated with the bel canto repertoire, especially the works of Rossini, and heroic roles in French grand opera. ↑ "OMTI Bravo International Award"
↑ Mary Bird, "Washington Concert Opera Celebrates 25 Years", , The Georgetowner, April 4, 2012 on georgetowner.com. Retrieved 25 April 2014. ↑ Anne Midgette, "Tenor Michael Fabiano leads Washington Concert Opera’s Il Corsaro, The Washington Post, March 10, 2014. Retrieved 25 April 2014.